The full court press to make T.J. Fowler a star in rock ‘n’ roll is well underway. I’m sure there were concerted efforts made by other artists and other record labels before this to systematically target the growing market but somehow with Fowler the methods seem a lot more transparent… even crass… something that goes beyond the company’s billing this on the label as “Rockin’ Blues” in small type, as if to assure any curious sort who frequents the dens of rock ‘n’ roll inequity that this is indeed meant for their tastes. I’m sure if they could’ve found a way to scent the record with reefer smoke, whiskey and cheap perfume to entice you further they would’ve. That’s hardly being critical. Far from it. Opportunistic maybe, but you’d be hard pressed to really call it disingenuous or exploitative. After all the goal of record labels is to sell records and the desire for artists is to do the same and make a name for yourself, so the idea that the methods used for this purpose might be pre-meditated and designed to maximize their chances is hardly revelatory. Fowler was tailor made for such manipulation. The session pianist behind some early Paul Williams hits meant he was ripe to jump at an offer to cut records under his own name. Whether the musical direction he headed into once he was in the studio was his own decision or one made for him it matters little because if he HAD been hoping to lay down some classier sides he would’ve been talked out of it before he got a chance to fully make his case. The overriding goal here for all involved was to take advantage of the booming rock movement that was rapidly overtaking young black America with what seemed to be its surest bet – a musician capable of creating some instrumental mayhem on record. If T.J. Fowler was unable, or unwilling, to do so they’d find someone else who would have no objections over being shoved towards potential stardom. This is National Records second such attempt to break Fowler into the marketplace this spring, as it seemed they were so anxious to see this plan put into action that they couldn’t help themselves. Either that or they were more dubious of its long term potential than they might let on and wanted to strike while the instrumental iron was hot in case it cooled off faster than anticipated. They’d have been smarter though to let his first efforts have the stage to themselves a bit longer rather than split whatever limited promotional resources they had on a second offering, especially because the top side of that last release, Red Hot Blues, was as scalding as anything he was likely to ever get down on wax. If the rock world was using records as résumés to judge an artist’s potential then you’d be hard pressed to find a stronger statement of intent than Red Hot Blues. There’s another reason why National Records would’ve been well advised to wait on releasing T.J. Boogie and that’s because for all of their plotting as to how to best capitalize on the rock tidal wave they seemed to have missed one small factor – as of yet there hasn’t been much certifiable response for rousing piano instrumentals. The few that might qualify as such, Todd Rhodes Blues For The Red Boy and Sonny Thompson’s Long Gone, were slower, sultry mood pieces, augmented by tremendous horn work which tied them in to the dominant instrumental trend in rock to date, the tenor sax revolution. 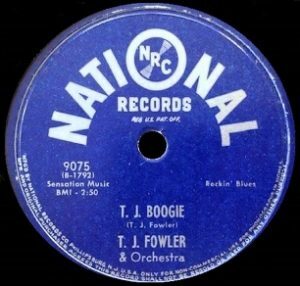 Fowler’s last record had side-stepped this problem entirely as his previous A-side featured solid vocals while its flip, Harmony Grits, was almost entirely horn driven. But while T.J. Boogie does feature a few shouted refrains and enough horns to at least fit into that more widely accepted realm, it’s Fowler’s piano that is the driving force behind the song and the feature which will have to connect with listeners in order for this to be a success. The failure of any full bore piano based rock instrumental to score big is hard to understand. The instrument contains plenty in the way of dynamics, capable of handling both rhythm and melody, not to mention plenty of showy flourishes to get the crowd on its feet. It’s certainly not reliant on a specific pace and even within a song can vary the tempo without it sounding the least bit unnatural or contrived. If you want to say the tone of the keys being pounded can start to sound harsh after awhile, well, okay, fair enough, but that’s what the other instruments are for, to add different colors to an arrangement. Toss in a smoking horn solo in the break, some crashing drums, and while guitars are still not being utilized much they weren’t completely alien to record producers to prevent them from inviting one to sit in and adding to the mayhem. In other words you had plenty of options to come up with something interesting, vibrant and unique, particularly to stand in contrast to the avalanche of pure sax based rockers that were everywhere through 1948 and ’49. But while there has been the occasional good effort in the piano rock instrumental realm – Forest Sykes storming Tonky Boogie foremost among them – for the most part the problem hasn’t been with the playing itself but rather the conception behind the records. All of the things we just laid out, the potential to create a textured record, hasn’t been taken advantage of other than in the aforementioned slower groove based sides of Thompson and Rhodes. The faster numbers have basically been the type of showstopper that works well in a crowded club when everybody’s juiced, as the pianist pounds the keys as if they owed him money while the other instruments either sit the song out or stay so far in the background as to avoid being hit with ivory shrapnel. Those can be done well but as records they hardly require frequent replaying to catch all of the nuances, since there IS no nuance to catch. When they do add other ingredients to the pot, as is done here with T.J. Boogie, they more often than not choose the wrong ones, then measure them badly and overcook it all leaving you with nothing more than an inedible mess. Nothing about this works the way it should. The shouted refrains that attempt to convey a wild party going on sound forced and artificial. They use the appropriate gusto but it’s far too calculated to come off well. It’s not off-putting or anything, merely unconvincing which gets this off to a bad start. Your skepticism is already high, as if you’re saying to Fowler, “Okay, bud, CONVINCE me!”. He does his best as T.J. Boogie kicks off with him laying down a solid left but it’s a simplistic boogie with no variation in the right hand once it gets going. Instead the horns jump in and what might’ve been – in better hands – strong reinforcements, turns into a millstone which drags this whole production down with it. We’ve detailed the ongoing problems with specific horns that were ill-suited for rock and bemoaned the archaic ideas about using the massed horn section approach enough over the past year to make many of these reviews seem to be merely variations on a theme, but when it began rearing its ugly head back in late 1947 the reasons for their moldy techniques were understandable. That was simply the dominant thinking when it came to employing brass sections. But over time it became increasingly obvious that rock ‘n’ roll was a different beast with different requirements altogether. The records which leaned too heavily on the past had a much higher rate of failure, both commercially and aesthetically, while those which were quickest to shed those aspects, downplaying or excising the higher range horns – trumpets and alto saxes – and using the full section in tandem only in spots, usually to lay down a brief repetitive riff over which the featured horn – that of the tenor sax – would be free to improvise were the efforts which resulted in the biggest hits while transforming the entire sound of black popular music. Now, more than a year after such advances had proven their mettle, the fact we were still hearing outdated horn parts on a regular basis showed just how deep seated that mindset was in music, and also just how stupid those folks in charge of these sessions were, all of whom continued to think they could buck the obvious trend by looking backwards. At this point we’re no longer cutting any slack in this regard. If you’re too dense to read the writing on the wall you deserve every bit of scorn we can muster and on T.J. Boogie there’s plenty to go around. If Fowler wanted to sabotage his chances at establishing himself in rock by recruiting refugees from the Harlem Hit Parade of yesteryear then he’s going to suffer the consequences. But let’s be honest, it’s not as if the rest of the track was cutting edge either and the horns were the only thing holding it back. Fowler is much too reliant on the far end of the keyboard, over-utilizing the treble keys rather than using them merely for intermittent embellishment while staking his claim in the mid-range keys which would provide more power and drive to this. The best part of the song, and really what saves it from complete irrelevance, is the rapid fire back and forth between the horns playing quick bursts rather than long droning riffs and the voices shouting a single word – Hey! – after each one. The interplay, though hardly anything innovative, is effective in getting you to believe they weren’t simply going through the motions after all. It doesn’t last though. They resume their tour through the back pages of discarded calendars as the song wraps up, never convincing us they were entirely suited to the task at hand, even if they were in fact giving it their all. And so it remains for someone else to convincingly show how the piano-led instrumental can be both exciting AND enticing enough for audiences to lay down their money at the jukeboxes or record stores and get an actual hit with one of these things. Fowler himself won’t give up on the attempt and over time will learn his lesson when it comes to jut how to approach all of this. 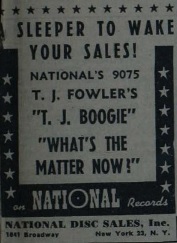 That he and National Records seemed to think they had the right formula now with T.J. Boogie only proves once again that oftentimes the last people to catch on to things in music are the ones entrusted with making it in the first place. Leave a reply on "T.J. Fowler: “T.J. Boogie”"